Fatehpur Sikri is one of the many UNESCO-recognized World Heritage Sites located in and around Agra that date back to the Mughal era of dominance, which stretched from the sixteenth into the seventeenth century. The state of Uttar Pradesh in India boasts of a city as well as a municipal board in the district of Agra. It is also popularly known as Fatehpur Sikri. Akbar, the renowned Mughal emperor founded the city in 1569. The city was the capital of the Mughal Empire between the years of 1571 till 1585. Akbar was a devotee of Salim Chisti. To honor the Sufi saint he wanted to shift the capital to Fatehpur Sikri from Agra. It is located at a distance of 23 miles i.e. 37 km from Agra. After reaching Fatehpur Sikri he began the building of a city walled from all sides. The city would include harems, courts, palaces, mosques and various other buildings of use. The city was coined Fatehpur. It derives its name from the word Fateh, which is an Arabic word; in Persian it means ‘victory’. It later came to be known as ‘Fatehpur Sikri’. Fatehpur Sikri is the place where Akbar’s Navaratnas were born. Fatehpur Sikri undoubtedly the best display of the architecture of Mughals in India. All the buildings in Fatehpur Sikri are majorly an end product of sandstone as it was easily available. The most famous Imperial Palace is made up of many independent pavilions. These pavilions are arranged in informal geometry on the leveled land. This is a pattern which is basically derived from the tent encampments that were popular in Arab and central Asia. Akbar took a lot of interest and play during the entire construction time period of Fatehpur Sikri. Owing to his strong Persian ancestral connections, Timur, Akbar’s ancestor from Persia, he worked towards reviving the Persian principles. Thus laid the foundation of the complex on Persian principles. Inevitably, the emperor used even Indian embellishments to decorate his buildings. The Imperial Complex was left abandoned in the year 1585 soon after it was completed. The reasons cited were shortage of water as well as closeness to the Rajputana states of the north-western side. Fighting was a natural and common phenomenon between the states. The very reason leading the Mughal capital to shift to Lahore. But in the year 1598, he came back to Agra with his entire focus on Deccan. Akbar did not come back to Agra to reign but only for a very short period in the year 1601. History states that the city was occupied by Muhammad shah for a very brief period between 1719-1748. His regent Syed Hussain Ali Khan Barha. The town today bears resemblance to a ghost town. The complex spread over an area of two miles long and a mile in breadth. It is surrounded by walls on 3 sides as was originally built. There are a few more buildings that stand in that area apart from the imperial Building. The town begins from the western end of the complex. A municipality since 1865 till the year 1904, the area was later modified as the ‘notified area’ with a total population of about 7,147 in the year 1901. The city is renowned for its masons and artisans. Sikri is a village now and it too exists nearby. Fatehpur Sikri, the city got its name after Mughal Emperor Babur had defeated Rana Sanga in a battle at a place known as Khanwa. Akbar had a deep desire to make Fatehpur Sikri his capital. For this, he built this majestic fort. But as he faced the scarcity of water in this area, he shifted his headquarters to Agra Fort. Akbar did not have any children. It was only after the blessings of Sufi saint Salim Chishti he was blessed with a baby boy. He was christened Salim after the saint’s named Salim. Salim went on to become Emperor Jahangir. The tomb of ‘Salim Chisti ki azar was built in the year 1571 by the great Mughal emperor Akbar. 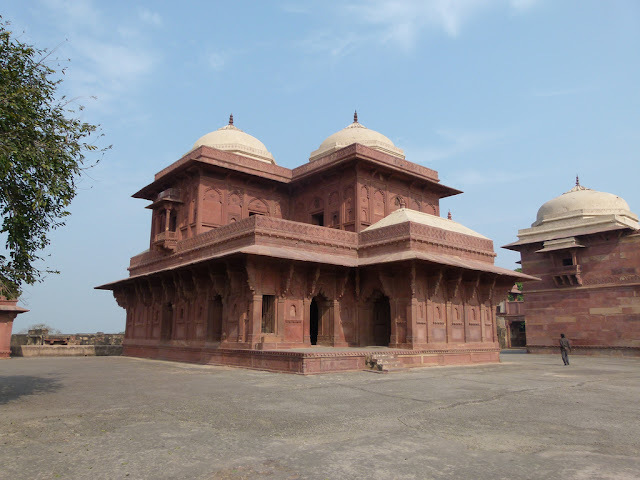 It was initially built of red sandstone but was later changed to a marble mausoleum. It was built much later than the Fatehpur Sikri Fort built by Akbar. It is one of the finest pieces of Mughal architecture. Mughals were extremely fond of architecture as is evident from the fact that built such spectacular buildings as were never seen before. The masjids, palaces are picturesque. Salim Chisti is synonymous with Sikri. Khwaza Salim Chisti was a Sufi saint of the Chisti order in 16th century India. The saint used to reside in the then dusty village of Sikri. It is said that Khwaza Salim Chisti blessed emperor Akbar with a son. The son was named Salim in reverence of the saint, who in the course of history came to be known as Emperor Jahangir Jahandar. Akbar later ordered the commissioning of the city of Fatehpur Sikri that had to be built out of the twin villages of Fatehpur and Sikri. In 1580-81 eighty years after the saint died in 1572, Akbar built the tomb in red sandstone. In 1606, Qutubuddin Khan Koka, on orders from Jehangir, covered the edifice in white marble. Much later in 1866, a district magistrate of Agra replaced the plaster dome with white marble. The magnificence of the splendid jail screens carved out of huge marble slabs shows a rare perfection of craftsmanship. The dramatic serpentine brackets supporting the wide chajja on all four sides of the edifice have an amazing grace. The real grave lies in an undisturbed repose in the crypt, closed to visitors. Women devotees longing for a child come here and tie a colored thread to the jails. In a gesture of thankfulness they come back when their wish is granted. When Khwaza Salim Chisti died, he was buried in the same Sikri complex where he once resided. A tomb that is popularly called Mazaar in Hindustani was later commissioned that stands in the middle of the courtyard of the Jama Mosque in Sikri Fort Complex. The structure falls slightly right from the line of view when one enters from the Buland Darwaza. If you take a bird eye view of this structure, it looks like a marble Jewel-box. Actually, the tomb was built originally with Red-sandstone but was later converted in to a marble one. The exterior is separated from the sanctum with the help of Jaalis. The Naqqashi and Jaali work of this low-domed tomb has fewer parallels in India. Inside, the structure is heavily ornamented with Pearls, Lapis Lazuli and Topaz. A green cloth covers the tombstone, typical of the Sufi order. The tombstone rests under a canopy beautifully carved out of ebony and decorated with pearl and brass. A corridor for circumambulation surrounds the square tomb chamber. The place sees hordes of visitors every day and is popular as a wish-fulfilling site among the barren women. As one enters Sikri from the Agra Gate, one of the nine gateways on the way to the palace complex, Diwani-I-Aam, or the hall of public audience appears first. It is a huge rectangular walled-in courtyard where petitions were heard, proclamations made, embassies received and entertainment programs held. The royal balcony, set within a frame of jail screens, appears on the western front. In front of the royal seat, a stone hook is still found embedded in the ground. As per tradition, Akbar’s pet elephant Hiran was tied to this hook to crush to death under its feet the head of the guilty. If it refused to obey thrice, the victim was freed. Resplendent in the aura of grandeur, which comes naturally from the red sand stones which are the basic construction materials used for the entirety of the complex, Fatehpur Sikri has always been one of the greatest tourist attractions of Uttar Pradesh. This ancient capital of Emperor Akbar is even today, one of the highlights for tourists planning Tours to Uttar Pradesh. Located in the heart of this ancient city is the Diwan-I-Aam, Fatehpur Sikri, one of the most important Monuments in Fatehpur Sikri. Built as a form of homage to the memory of the memory of the great Sufi saint, Sheikh Salim Chisti, who, it is said, blessed the emperor with an heir to the Mughal throne in India, who was to be later known as Jahangir, Fatehpur Sikri was built in 1571 and stood as the capital of the Mughal empire till the year 1585. Finding its name in the prestigious list of heritage monuments as laid down by the renowned organization, UNESCO, Fatehpur Sikri is today one of the greatest prides of Indian culture. Perhaps, no other monument in Fatehpur Sikri can take credit for this honor as can the Diwan-I-Aam, Fatehpur Sikri. Throwing light on the social system, which existed during the Mughal period, a trip to Fatehpur Sikri also reveals the intricacies of the Mughal system of governance. Perhaps nothing reflects the workings of that ancient age as well as does the Diwan-I-Aam in Fatehpur Sikri. Roughly translated as the hall for public audience, the Diwan-I-Aam, Fatehpur Sikri is the durbar or hall where Emperor Akbar interacted with his subjects on a one to one basis. Surrounded, by roads which were probably once lined with shops and stalls of a bustling capital city of the mighty Mughals, the entirety of the stretch of the roads in and around the Diwan-I-Aam in Fatehpur Sikri, today take us back to the age of its golden past. A stark contrast to the ornate decoration of the Diwan-i-Khas in Fatehpur Sikri, the simplicity of the Diwan-I-Aam, Fatehpur Sikri shows us another side of the emperor, in which we find shades of the benevolent despot as well as the broad minded ness which gave birth to the beautiful principles of Din I Ilahi, the religion which Emperor Akbar had founded and popularized. Fatehpur Siri might have been abandoned in less than 15 years from the day it was constructed, it has left many heritages to ponder upon and appreciate. Most of these monuments are living examples of Indo-Islamic architectural blend in India. Panch Mahal is one of them. Panch Mahal is basically a five-storied structure that can easily pass as an architectural marvel. Panch Mahal also signifies the undiluted imprint that Buddhism has left on the Indian psyche. This is proved by the fact that Panch Mahal is built on the Buddhist architectural style. Panch Mahal, a five storeyed pavilion, stands on the western line of the courtyard. This is the badgir, the Persian wind tower for ladies of the harem. The jail screens between the 176 differently carved pillars have disappeared. Once these screens provided purdah (cover) to queens and princess on the top terraces enjoying the cool breezes and watching splendid views of Sikri fortifications and the town nestling at the foot of the ridge. In the courtyard Akbar played pachisi (checker board) with dancing girls as live pieces. Built on the pattern of a Buddhist Temple, Panch Mahal was basically a pleasure palace of emperor Akbar. He primarily used it for relaxation and entertainment purpose. The structure has been so designed that each story is pillared and is smaller than the other as you move upwards. While no less than 84 columns support the ground floor, the uppermost domed floor has only 4 columns. The whole structure is very airy and was styled to give respite from the scorching summers of Agra. Panch Mahal stands close to the Zeenana quarters or Harem and that consolidates the fact that it acted as a pleasure palace. The pillars that originally had Jaalis between them support the whole structure. The women of the royal household and ladies of the harem originally used the pavilion and that is why Jaalis have been used. The pavilion gives a majestic view of the fort that lays on its left. The Jami Masjid mosque at Sikri was the first structure to be built in 1571. The exterior is modest but the interior carries the most gorgeous ornamentation in the floral arabesques and ingenious geometrical patterns in brown, red, turquoise, black and white. The spacious courtyard adds a stately charm to the place. It could accommodate ten thousand men at prayer. Akbar was so enthusiastic about this mosque that he occasionally swept the floor and gave azan (call for prayer). On June 26, 1579, Akbar even read the khutba himself, a great innovation, earlier attempted only the Timur and Mirza Ulugh Beg. Jami Masjid in Fatehpur Sikri is one of the most notable tourist destinations for people visiting Fatehpur Sikri in Uttar Pradesh. Agra is usually the base if you wish to visit Fatehpur Sikri end explore the place. Agra is well connected to Delhi and some other major Indian cities by air. The Taj Express or the Shatabdi express are the options if you are looking to travel by rail. Located at a distance of 204 km from Delhi, many people also prefer to drive down to Fatehpur Sikri. Jami Masjid is an awe inspiring structure. The mosque was built in 1571 under the patronage of the Mughal Emperor, Akbar the Great. The mosque is one of the largest in the world. The temple, quite like all other Mughal architecture, is built on a raised platform and has a large central dome with surrounding minarets and other smaller domes. The exalted courtyard is used for religious gatherings now, where devout Muslims gather to pray. Jami Masjid in Fatehpur Sikri in Uttar Pradesh is built with a combination of red sandstone and fine, white marble. Buland Darwaza, the colossal triumphal arch, was built in 1575 on the southern wall of the courtyard. It celebrates Akbar’s conquest of Gujarat. The towering portal has the height of 176 feet from ground level and 134 feet over the top step. The grand recessed central arch is the most magnificent of its kind in the entire range of Mughal architecture in India. Modest ornamentation with calligraphy contains a famous line: The world is but a bridge: Pass over but build no houses on it. The Buland Darwaza commands the landscape for miles. 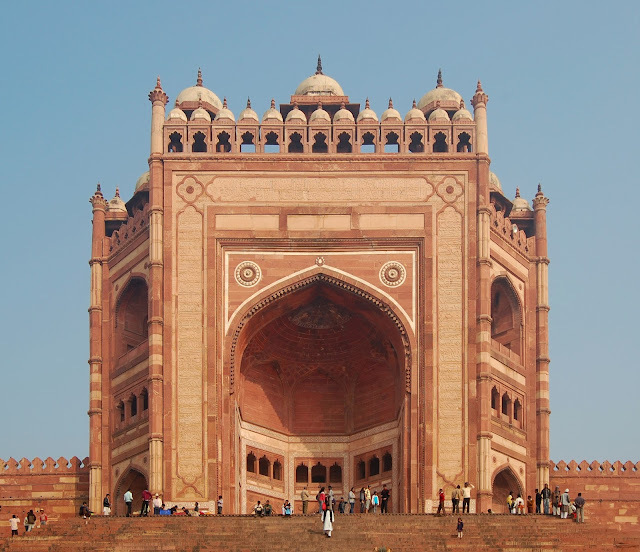 Buland Darwaza is a 15-storied high gateway that guards the Northeastern entrance of the city of Fatehpur Sikri. Historians have come to a consensus that this building was constructed in the year 1575. It was commissioned by Emperor Akbar to commemorate his victory over Khandesh and Ahmednagar in Gujarat and Deccan respectively. The intimidating structure stands 43 meters or 140 feet on the pedestal and a cool 54 feet above the ground. The gateway is approached by a steep flight of 42 steps, which add height and majesty to the entire structure. Buland Darwaza that is counted as one of the tallest gateways in the world is almost entirely made out of the red-sandstone with a generous dose of marble decoration on it. The blend of Hindu and Persian architecture is very evident by the use of Quranic inscription on the front and pillar and Cenotaph on the heights of the gateway. The calligraphy work done on the inner façade of Buland Darwaza has very less parallels in India. Buland Darwaza has a very famous inscription written on it. This inscription is actually a quote attributed to Jesus Christ, who is revered equally by both Christians as well as Muslims. It says, “The World is but a bridge, pass over but build no houses on it.” that is almost ironical for a city that was abandoned in less than 15 years from the day it was constructed. The moment you step into the premises of the Fatehpur Sikri in Uttar Pradesh in India, you are transported to an era of the past, which still surrounds almost the entirety of the complex. The streets, today deserted take you past the lives and days of the great Mughals, an era which can be said to constitute what today is known as the golden era of the history of India. A definite must include if you are planning a tour itinerary to Uttar Pradesh a trip to Fatehpur Sikri is a wonderful way of rediscovering our rich heritage and culture. One of the most important Monuments in Fatehpur Sikri, the Birbal Bhawan, Fatehpur Sikri can be said to be one of the most important tourist attractions of the entirety of Fatehpur Sikri. Built as a form of homage to the memory of the memory of the great Sufi saint, Sheikh Salim Chisti, who, it is said, blessed the emperor with an heir to the Mughal throne in India, who was to be later known as Jahangir, Fatehpur Sikri was built in 1571 and stood as the capital of the Mughal empire till the year 1585. One of the most striking relics of the rich history and culture of India, the entirety of the complex of Fatehpur Sikri has been awarded by UNESCO by putting the monument as an important part in the prestigious list of heritage monuments in the world. Perhaps, no other monument in Fatehpur Sikri can take credit for this honor as can the Birbal Bhawan, Fatehpur Sikri. 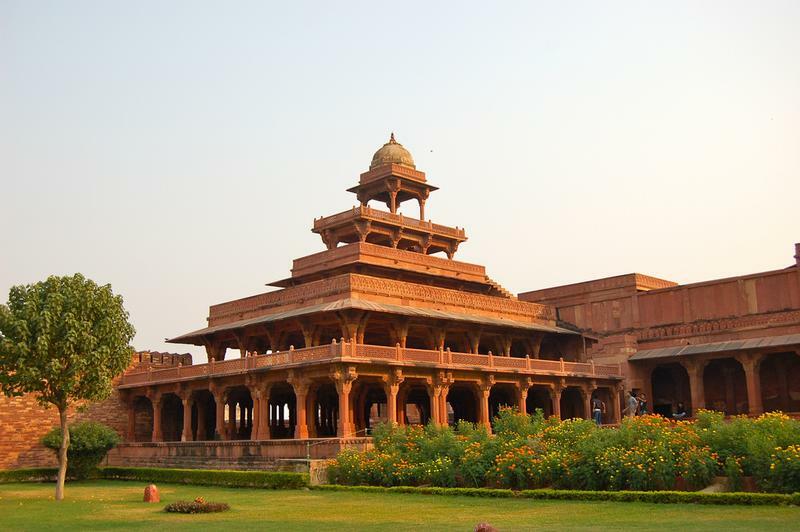 Seen to be the residence of Birbal, one of the Navaratna or Nine Jewels of the court of Emperor Akbar, the Birbal Bhawan in Fatehpur Sikri can be rated as one of the most important tourist attractions of Fatehpur Sikri. It is easy to imagine the life that set the pulse of the bustling capital of the ancient Mughals racing even by looking at the ruins of Fatehpur Sikri today. Narrow intersecting roads, which lead to some of the most spectacular palaces, gardens and holy places, had probably been the only lives the subjects of Akbar knew at the time. Till the fort was abandoned due to a severe scarcity of water, all the palaces and roads of this ancient land mark remained well maintained. Throwing light on the city are the various monuments of Fatehpur Sikri, notable among which is the Birbal Bhawan, Fatehpur Sikri. 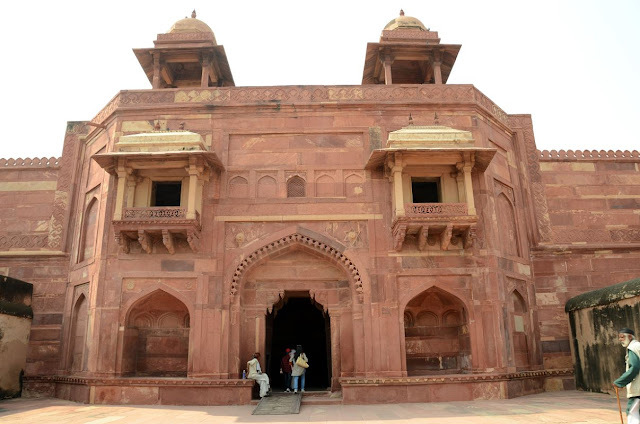 Though it cannot be ascertained that the palace ever housed this importat jewel of Akbar’s court, the palace is connected via a screened passage to the Haram sara viaduct, which in turn leads to the Hathi Pol, one of the most prominent attractions of Fatehpur Sikri. Abdul Fazl, Akbar’s historian, mentions that the royal harem had nearly 5000 wives. The queens always brought with them a great entourage of maids and dancers. The queen mother and princess had innumerable slave girls as their attendants. The member of concubines, families of courtiers away on royal duty, and dancing girls was always on the rise. The harem included not only the chief wives but all women inmates. Haresara (female quarters) occupies the largest central area in the royal enclosure at Sikri. Jodha Bai’s palace belonged to Harkha, the Amber princess and mother of Jehangir, and the other Rajput wives from Bikaner, Marwar, Jaisalmer, Merta and Durgapur and their companions. No wife of Akbar was called Jodha Bai. One of Jehangir’s wives was so called. This is a high-walled edifice, guarded by a grand gateway leading to a spectacular courtyard. With double storeyed pavilions at the center of colonnades on all four sides, this place has some striking Hindu architectural features like ornamental columns, bells and chain motifs, heavy brackets and niches on the wall for the deities worshipped by Rajput ladies.The other smaller but beautiful palace belonged to Akbar’s mother, Hamida Banu Begun, widow of Humayun. She was the most respected lady of the harem with the title Mariam-Makani. This palace is also called Sunehra Makan (golden house) because of the golden paint on the faded murals. The third palace in the harem quarters belonged to Akbar’s two senior wives: Ruqayya Sultan Begum (who brought up Jahangir’s son Khurram later called Shahjahan), and Salima Sultan Begum-widow of Bairam Khan. Maybe here lived Birbal’s daughter who was married to Akbar hence its present name, Birbal Mahal. Surely no male could have been allowed to stay within the corner of the Sikri ridge. The two residential buildings to the north of the Jami Masjid are said to be used by Abul Fazal and his elder brother Faidi. These buildings have almost similar dimensions and plan and are made up of red sandstone. The building on the southeastern side is said to be Abul Fazal’s House. The rectangular single-storeyed building has a tibara dalan or verandah with three openings in front and two pairs of carved and stylized columns. The fluting capitals of the columns with beautiful brackets supporting the lintels of the roof look quite impressive. The two small chambers on either side of the verandah lead directly on to the terrace of the building. The central oblong room of the building is the largest one too and has three flat topped doors. On its either side, there are two rooms with three engrailed arched entrances. The central broader arch has spandrels adorned with beautiful rossets. Originally, the ceiling of the main room and verandah were painted with bright colors but they have now disappeared with time. One can reach the rooms on the upper storey by a flight of steps. There are two suites of rooms above that are connected by a narrow gallery. A stairway from the upper storey leads to the baths and toilets on the southwestern side. Hiran Minar is located in the open plains. This 21.34m high tower got its name after Jehangir converted the polo ground around the tower into a sanctuary for hiran (antelopes). The tower is entered through a flat-topped door bordered by sand stone panel and flanked by closed arched panels. There are 53 steps leading to the top inside the tower. One can get a bird’s eye view of Fatehpur Sikri from the top of the tower. The tower is octagonal upto the height of 3.91m and circular to the rest of the height. The tower stands over an octagonal platform, which in turn stands on a square one. The lower square platform is 21.96m sq. and the octagonal platform is 1.2m high and is edged by a small cornice. Double flight of 9 steps has been provided on northern and eastern side, which is 3.05m high. This tower is decorated with an alternate row of six pointed star and hexagons. Numerous elephant tusks are protruding from the center of the each star and hexagons (now replaced with stone tusks). It is believed that real elephant tusks symbolize the novelty and grandeur of Mughal Empire. Rang Mahal or the Pleasure Palace is situated to the west of Jami Masjid. One of the oldest buildings of Fatehpur Sikri, it showcases several decorative motifs that were used here for the first time. It is in ruinous condition now. It is said that Akbar built it for his wife on advice of Sheikh Salim and that prince Salim was born here. The surviving portions of the palace have two courtyards in the southeast corner of the building with the pair of tall twelve-sided columns that have extraordinary double capitals and a deeply coffered roof. The beautiful brackets of these columns are shaped like heads of horses. It is said that originally it had five inner courts, one in the centre having one court on each side. The red sandstone palace had main entrance to its north. The eastern courtyard has three openings or tibara dalan. The inner closed room in here has survived. It also has a double storyed façade overlooking the court below. The building has a double storeyed living room, which lacks any superstructure or dome. Its beauty lies in the series of brackets used here. Despite its pitiful condition, this building is believed to be the best example of residential architecture in India. Known as ‘Barahdari’ as it has twelve doorways, this single-storeyed red sandstone building is rectangular in shape with three doorways on each side. The arched doorways grace its northern and southern sides while the eastern and western sides have flat-roofed doorways. Though, people believe that Tansen, one of the Nine Gems of Akbar’s court who was a famous musician lived here, the idea seems to be too absurd to be true. Not only the building is too small for a nobleman’s house with only a single oblong hall, it has no attachments that are a must in a residential house such as hammams or baths, toilets or room for the ladies. The hall is surrounded by a pillared verandah on all sides. Interiors of the hall are kept simple with simply a wagon-vaulted ceiling and a flat roof while the exteriors are adorned with elegant marble and buff sandstone inlay work done in geometrical designs such as the hexagons and pointed star patterns. The roof of the verandah consists of sloping stones slabs resembling ‘khaprel’ or tiles that are supported on pillars and architraves. The name of this magnificent structure is totally arbitrary because it has neither twelve doors to be called Barahdari and nor there are any proofs linking it to Todarmal, the finance minister of Akbar’s court. It cannot be a residential building of this nobleman because it consists of only a single hall with open gallery and has no other attachments nor it can be his tomb, for Todarmal being a Hindu minister could not have been buried in a tomb. This double-storeyed building is made up of red sandstone and is square in shape with chamfered angles. There is a tibara dalan in the middle of each façade of building on the ground floor and the arches are synchronized well with pillars and brackets on the upper storey. The corner rooms are given delicate tower like forms and are inter-connected. The upper storey has rectangular corridors overlooking the hall below. It has no dome or chhatri but the presence of the brackets suggest that there must have been a chajja supported by them. The central hall has a vaulted soffit but a flat roof and thus, this building presents harmonious fusion of different architectural traits. Jodha Bai’s palace is the largest and most important part of Imperial Harem, having all facilities, provisions and safeguards. The name Jodha Bai palace is a misnomer in itself. It is most widely accepted that the building was for Raniwas or Zenani-Dyodhi. The palace building consists of a rectangular block measuring 231’8″x215′ in dimension, with a single magnificent gateway on eastern side, which was protected by guard rooms, having triangular ceiling and other apartments. Several Hindu motifs have been used in the building, which confirms that occupant of the building was a Hindu lady. The beauty of the red sand stone charms you the moment you step within the vicinity of the Fatehpur Sikri while on a Tour to Uttar Pradesh. Elegance personified, the entirety of the complex of Fatehpur Sikri is adorned with some of the finest elements of the reign of the Mughals. 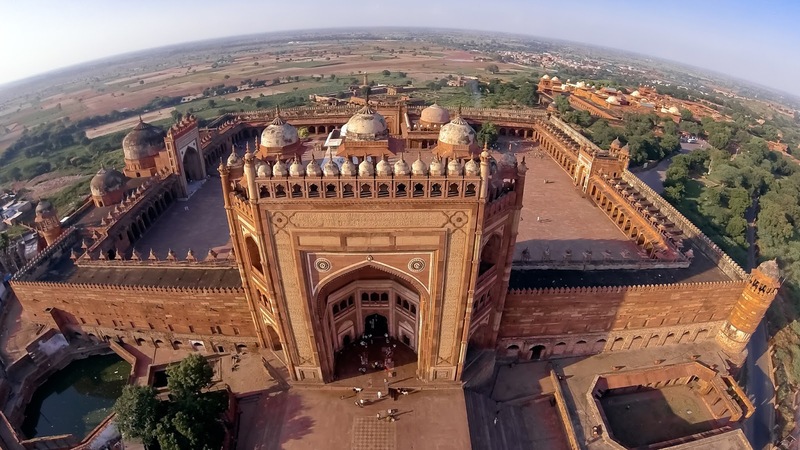 Characteristic in its grandeur, which corresponds to the regality of the Mughals, the entirety of Fatehpur Sikri is a definite must include if you are planning a tour to Uttar Pradesh. 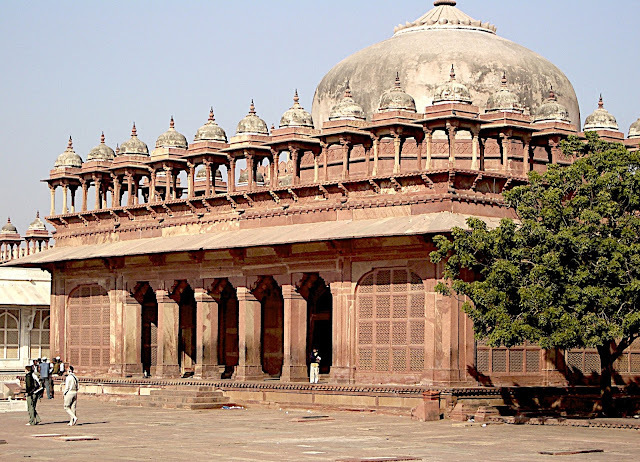 Of the Monuments in Fatehpur Sikri, perhaps one of the most notable is the Palace of Jodha Bai, Fatehpur Sikri. The palace of Jodha Bai or the Rajput queen of Emperor Akbar, the Palace of Jodha Bai in Fatehpur Sikri is one of the most charming examples of the amalgamation of the apparently opposing architectural styles of the Rajputs and the Mughals. The palace, which is located on the eastern side of the entirety of the fort, was used, according to modern historians as a residence for the various queens of Akbar as well as the other members of the harem. Corresponding to the style used in Hindu architecture, the main palace has a courtyard, around which the entirety of the palace is built. The living quarters are all built after keeping the courtyard as the center of the complex. Added to the brilliance of the red sandstone are the turquoise bricks, which are used on the roofs of the buildings. Caravan Serai is at near Hathi Pol. The building was built as a guesthouse for important persons or traders. Interior of the Serai has a spacious quadrangle court of 74.82m by 82.66m in dimension. There are residential rooms on all the four sides of this grand court. Besides these rooms, there are also terraces built on southeast side of the Serai. These rooms once had pillared verandahs in front, which have now been demolished. The presence of tank and well on the southeast side of Serai suggests that water and toilet facilities were also provided to the guests. Caravan Serai is located on the slope of the ridge, which was beautifully utilized by terraced construction. It is rectangular in plan having its main entrance in the middle of the northwest side. The gateway stands over a small plinth, which was broken in the middle to allow access to the main entrance archway, which is flanked by two smaller ones. The spandrels of these arches are made up of marble and are decorated with rossets of red sandstone. The smaller arches are also decorated with marble. The soffits of the arches were once decorated with stuccowork in geometrical designs. Kheria Airport in Agra is the nearest airport to Fatehpur Sikri located at a distance of around 40kms. One can get a taxi from airport to the destination. Agra Cantt Railway Station in Agra is at a distance of 40kms from Fatehpur Sikri. The trains are available regularly. Well constructed roads of Fatehpur Sikri opt for a great transportation facility to the tourists. The UPSRTC bus service provides decent service to the tourists and is affordable to ones pocket.